Chicago is always an outstanding group tour destination and there’s literally hundreds of tours available, but one towers above the rest. 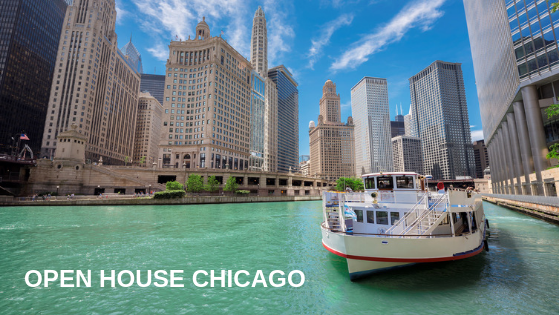 When your group wants only the coolest, most unique and most interesting of Chicago tours, there can be only one choice — the Chicago Architecture Center’s Open House Chicago (OHC)! This annual one-weekend-only celebration of Chicago architecture is a brief open door to the beauty that lies within more than 250 of the city’s most iconic structures, as well as many little known buildings that harbor surprising splendor. In just a few years, OHC has become “the largest citywide architecture festival in North America and the second largest in the world, behind Open House London.” And, it’s FREE! This year OHC is scheduled for October 13-14, so the first thing you and your group will want to do is charter your Indian Trails motorcoach and then get down to the business of plotting your tour. Begin by following OHC at #OHC2018 on Twitter and check them out on Instagram and Facebook as well to get the latest updates. Or, for even more information, you can sign up for the email newsletter. Now that you’re all tuned in to OHC news, you will want to check out the sites that will be open to the public. The buildings are located throughout the greater Chicago area in more than 20 neighborhoods. Some are passed by thousands of people every day who have never seen what lies within. The tour includes almost every conceivable type of structure from majestic homes to skyscrapers, clubs and theaters, houses of worship, hotels, and offices, each with its own special cultural, architectural or historical attributes. For many of the buildings, the only time the public is admitted is during the OHC so it may be a once-in-a-lifetime event for some! To get an idea of what’s in store, visit the OHC archives, view breathtaking images and read about sites from 2017, 2016 and 2015 OHC events. At this point you may be overwhelmed by the sheer numbers of buildings available for touring so now is a good time to consult the map and drill down into the neighborhoods with the most sites that appeal to your group. The archives also have maps you can use to literally pinpoint sites from past tours that can add a little direction to the most desired paths. The Cliff Dwellers Club – Offering one of the best views of Grant Park, the private club for artists and patrons of the arts was started in 1907 and now resides on the 22nd floor of 200 South Michigan Avenue — the A. Epstein & Sons building completed in 1957. 465 North Park Apartments - Brand new in 2018, the 48-story architectural gem is the tallest residential address in the Streetville neighborhood. The tower is cylindrical glass and the four-story base offers parking, offices, shopping and eateries. Needless to say, the panoramic view from the deck is amazing! The Columbia Yacht Club ­– At the intersection of Randolph Street and the Lake Michigan shore, the Columbia Yacht Club dates back to 1892 and now has its headquarters in a 372-foot train ferry — the MV Abegweit – purchased from Canada in the mid-1980s. Originally the “most powerful icebreaking ship in the world,” it now provides an elegant home to the club, including an exclusive dining room, outdoor deck, and steering deck. The Wheeler Mansion – In the South Loop/Prairie district this three-story beauty was built in 1870 as a residence and over the years has been home to several businesses such as serving as a warehouse for the Murphy Butter and Egg Company! Now restored to its original grandeur it’s a boutique hotel and a designated Chicago Landmark.